Contact us for a free survey & estimate! Tennis Planning Corp. will perform all site clearing and construct all necessary retaining walls. Severely sloped and heavily wooded sites are never a problem. We will meet all your town's construction codes. Our in house personnel process all engineering and surveys required by your village and will obtain all your necessary permits and certificate of occupancy, upon completion. Why run around trying to find court time? Have a place were everyone can congregate and have fun together. 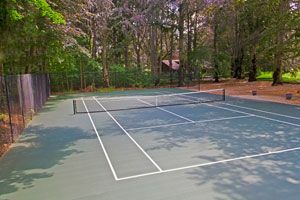 All you need is approximately 60' by 120' for your own private tennis court. 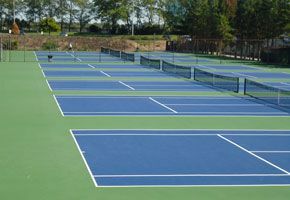 At Tennis Planning Corp. we do not just build tennis courts we design the entire tennis environment. 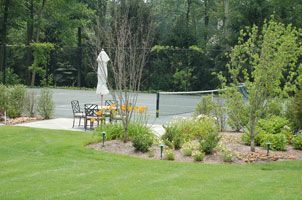 Our staff includes landscape architects who will carefully plan your tennis court design and development.